Invasive aspergillosis is one of the most important and fatal complications after liver transplant, especially in patients with involvement of the central nervous system. We present a case of a patient who developed cerebral and pulmonary aspergillosis, coinfected with cytomegalovirus, after liver transplant for toxic fulminant hepatitis. The patient was treated successfully with neurosurgical intervention and voriconazole. Voriconazole is considered more effective in cerebral aspergillosis than other anti-fungal agents due to the greater penetration into central nervous system and higher cerebrospinal fluid and brain tissue levels. Invasive aspergillosis in liver transplant recipients is uncommon, with frequency from 1% to 8%. However, invasive aspergillosis is one of the most important and often fatal opportunistic fungal infections, with an associated mortality rate > 90%, especially when the central nervous system is affected in liver transplant recipients.1-5 Aspergillus infections usually occur within the first month after transplant, and the most frequent form of invasive aspergillosis is pulmonary aspergillosis. However, 10% to 25% of all cases of invasive aspergillosis have central nervous system involvement, presumably disseminated through the blood stream.3,6 In the past, invasive aspergillosis with central nervous system involvement had a high mortality rate of almost 100%, but survival has been improved with introduction of voriconazole for treatment of cerebral aspergillosis.7 We report our successful treatment of a liver transplant recipient who had cerebral aspergillosis combined with cytomegalovirus (CMV) infection using voriconazole. A 55-year-old woman underwent deceased-donor liver transplant for fulminant hepatic failure caused by toxic mushroom ingestion. She had no previous history of viral or autoimmune hepatitis, other liver disease, or medication for chronic disease. She was comatose and had Model for End-Stage Liver Disease score of 28 preoperatively on hospital day 8. There was no evidence of infection on microbiologic studies including cultures. In addition, the donor had no evidence of viral, bacterial, or fungus infection. Liver transplant surgery was performed in routine standard manner without complications, and the grafted liver started to function immediately. Immunosuppression consisted of induction with methylprednisolone and basiliximab and maintenance with tacrolimus (target level, 10-12 ng/mL), prednisone, and mycophenolate mofetil. On postoperative day 4, the patient recovered consciousness and was tapered from the ventilator. Early after surgery, there was intermittent high fever without evidence of infection on microbiologic study and chest radiography. However, intermittent fever spontaneously subsided on postoperative day 5, and the patient recovered without any symptoms or signs of infection or hepatic dysfunction. On postoperative day 25, the patient developed persistent nausea, vomiting, headache, and visual disturbance without neurologic impairment on examination. On the computed tomography (CT) scan of the chest, a round peripheral enhancing lesion (size, 3 cm) with central necrosis was observed in the right lower lung (Figure 1). 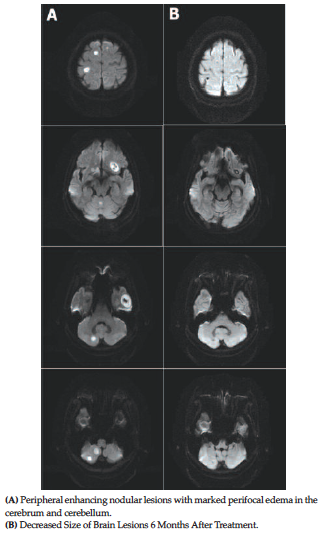 Brain magnetic resonance imaging (MRI) scan showed multiple peripheral enhancing nodular lesions with perifocal edema scattered throughout the whole brain (Figure 2). 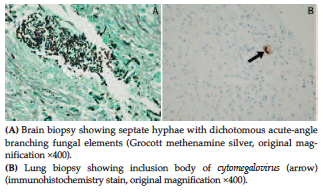 Histopathologic examination of the specimens taken from the lesions of the lung by aspiration, and the brain by excisional biopsy, showed multiple septate hyphae and inclusion bodies typical of CMV (Figure 3), consistent with the diagnosis of invasive pulmonary and cerebral aspergillosis combined with CMV infection. For the treatment of invasive aspergillosis and CMV infection, intravenous voriconazole (8 mg/kg/d) and ganciclovir (5 mg/kg/d) were used immediately. Fungal cultures from the abscesses grew Aspergillus fumigatus, and CMV antigenemia test showed 106 antigen-expressing cells per 200 000 polymorp-honuclear leukocytes. Tacrolimus was reduced (target level, 5 to 7 ng/mL) and mycophenolate mofetil was stopped. Follow-up CT scans at 1 and 2 months after voriconazole treatment showed decreased size of the lesions in the lung and brain without any newly developed lesion. Headache and visual disturbance improved slowly after treatment was started. After intravenous voriconazole and ganciclovir treatment for 2 months, medication was switched to oral voriconazole (200 mg twice daily) for 6 months and prophylactic valganciclovir (900 mg/d) for 3 months. Multiple abscesses in the brain and the pulmonary lesion were remarkably reduced in size after treatment for 6 months. The patient’s symptoms subsided and the lesions completely disappeared on imaging studies at 18 months after transplant (Figure 1 and 2). Before introduction of voriconazole for antifungal treatment, most patients who had cerebral asper-gillosis died.20 After the introduction of voriconazole for treatment of cerebral aspergillosis, survival rates of 30% were reported in high-risk patients.7 Improved survival rates may be due to the greater penetration of voriconazole across the blood-brain barrier, with higher cerebrospinal fluid and brain tissue levels than other antifungal agents.20,21 In a few case reports and a retrospective study, immediate neurosurgical intervention for diagnosis and therapy also is associated with improved outcomes.5,7,22 In our case, immediate neurosurgical intervention (excisional biopsy) for diagnosis, reduction of immunosuppression, and antifungal treatment with vorico-nazole resulted in successful outcome. In conclusion, this case indicates that the possibility of invasive aspergillosis should be considered in high-risk patients when fever occurs early after transplant, even when there is no evidence of infection on serologic and microbiologic studies. In patients with cerebral aspergillosis after liver transplant, prompt diagnosis and aggressive treatment including neurosurgical intervention and antifungal medication with voriconazole are most important for a favorable outcome. Singh N, Wagener MM, Marino IR, Gayowski T. Trends in invasive fungal infections in liver transplant recipients: correlation with evolution in transplantation practices. Transplantation. 2002;73(1):63-67. Cruciani M, Mengoli C, Malena M, Bosco O, Serpelloni G, Grossi P. Antifungal prophylaxis in liver transplant patients: a systematic review and meta-analysis. Liver Transpl. 2006;12(5):850-858. Romero FA, Razonable RR. Infections in liver transplant recipients. World J Hepatol. 2011;3(4):83-92. Tsitsopoulos PP, Tsoulfas G, Tsonidis C, et al. Successful, combined long-term treatment of cerebral aspergillosis in a liver transplant patient. Virulence. 2010;1(5):465-467. Cherian T, Giakoustidis A, Yokoyama S, et al. Treatment of refractory cerebral aspergillosis in a liver transplant recipient with voriconazole: case report and review of the literature. Exp Clin Transplant. 2012;10(5):482-486. Schwartz S, Ruhnke M, Ribaud P, et al. Improved outcome in central nervous system aspergillosis, using voriconazole treatment. Blood. 2005;106(8):2641-2645. Mucha K, Foroncewicz B, Orlowski T, et al. 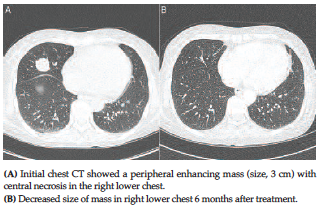 Atypical presentation of invasive pulmonary aspergillosis in a liver transplant recipient. Ann Transplant. 2013;18:238-242. Leung V, Stefanovic A, Sheppard D. Severe cerebral aspergillosis after liver transplant. Transpl Infect Dis. 2010;12(1):51-53. Selby R, Ramirez CB, Singh R, et al. Brain abscess in solid organ transplant recipients receiving cyclosporine-based immunosuppression. Arch Surg. 1997;132(3):304-310. Klont RR, Mennink-Kersten MA, Verweij PE. Utility of Aspergillus antigen detection in specimens other than serum specimens. Clin Infect Dis. 2004;39(10):1467-1474. Viscoli C, Machetti M, Gazzola P, et al. Aspergillus galactomannan antigen in the cerebrospinal fluid of bone marrow transplant recipients with probable cerebral aspergillosis. J Clin Microbiol. 2002;40(4):1496-1499. Neofytos D, Shoham S, Dierberg K, et al. Diagnostic and therapeutic challenges in a liver transplant recipient with central nervous system invasive aspergillosis. Diagn Microbiol Infect Dis. 2012;73(4):374-375. Singh N, Arnow PM, Bonham A, et al. Invasive aspergillosis in liver transplant recipients in the 1990s. Transplantation. 1997;64(5):716-720. Gayowski T, Marino IR, Singh N, et al. Orthotopic liver transplantation in high-risk patients: risk factors associated with mortality and infectious morbidity. Transplantation. 1998;65(4):499-504. Fortún J, Martín-Dávila P, Moreno S, et al. Risk factors for invasive aspergillosis in liver transplant recipients. Liver Transpl. 2002;8(11):1065-1070. TJ, Anaissie EJ, Denning DW, et al. Treatment of aspergillosis: clinical practice guidelines of the Infectious Diseases Society of America. Clin Infect Dis. 2008;46(3):327-360. Fishman JA. Infection in solid-organ transplant recipients. N Engl J Med. 2007;357(25):2601-2614. Singh N. The changing face of invasive aspergillosis in liver transplant recipients. Liver Transpl. 2002;8(11):1071-1072. Schwartz S, Thiel E. Cerebral aspergillosis: tissue penetration is the key. Med Mycol. 2009;47(suppl 1):S387-S393. Schwartz S, Reisman A, Troke PF. The efficacy of voriconazole in the treatment of 192 fungal central nervous system infections: a retrospective analysis. Infection. 2011;39(3):201-210. Coleman JM, Hogg GG, Rosenfeld JV, Waters KD. Invasive central nervous system aspergillosis: cure with liposomal amphotericin B, itraconazole, and radical surgery - case report and review of the literature. Neurosurgery. 1995;36(4):858-863. Acknowledgements: The authors have no conflicts of interest to declare. No funding was received for this study.